For a half century, GTR Campbell has offered a turnkey ship creation service, applying a unique project- oriented philosophy that turns conflict of interest into mutual interest. New regulations may have changed a design's lifespan but not the series concept. Today, Antony Prince is internationally recognized as the President of GTR Campbell Marine Consultants and successor to the legacy of the company founder, famed naval architect George Campbell. But 10 years ago. Prince was just a man with a plan and some mighty big shoes to fill. Prince had been George Campbell's close friend and associate for over 20 years. In 1990. the aging Campbell turned the company over to his protege, cautioning that, for a consultancy, reputation was not easily transferred from one man to another. Campbell was a gifted naval architect who put his stamp on the shipping industry by introducing series ship design in a mass-production shipbuilding program based in Japan. Between 1965 and 1989. 338 series built dry cargo ships were constructed to his plans, and under GTRC supervision, at IHI and licensees. Most were built on just two standard designs that became industry benchmarks: 172 copies of the 14.800 dwt Freedom and 80 of the 21.500 dwt Fortune, vessels that today's elder shipowners recall with great fondness. "Built to a branded, standard design, a ship starts life with a commercial identity," says Prince. "Her characteristics are already known among charterers, potential crew and stevedores, so she starts out as a preferred carrier." But times have changed, he acknowledges and the series production concept must also change. "With the introduction of new bulk carrier requirements every few years, the marketing life of a single design is much shorter today than in the past." Campbell capitalized on a massive renewal in the Handysize sector, and history may be repeating itself for his successor. Some 45 percent of the 2.200 ships below 35,000 dwt are currently over 20 years old and face replacement or scrapping. With the sector disintegrating at the edges - small cargoes once carried in ships below 20,000 dwt now move mainly in containers, while the largest Handysize parcels are finding more effective carriage in Handymaxes - it is expected that the majority will not be replaced. But even if the sector shrinks by 80 percent, says Prince, it offers designers and builders a golden opportunity. He should know. A Handysize put him back in the game. In 1994. Prince had yet to overcome the burden of legacy and prove to a skeptical industry that he could pick up where Campbell had left off. That year, he finished development of an advanced double-hull 29.000 dwt bulk carrier design he branded the Fantasy. When the Clipper Group and Dockendale Shipping signed a contract for five of the vessels to be built at China's Dalian Shipyard, the GTR Campbell name leapt back into the spotlight. Hailed as "a maid of all work for the 21st century." the Fantasy design proved popular, spawning a 12-ship series over three years and refocusing the attention of a new generation of shipowners on the virtues of seriesbuilt ships. Since then, GTRC has produced some 45 ships in six series of its own design, five bulk carrier designs - the Fantasy, the 27,000 dwt Festiva and Fortune Mkll. the 32,500/34.300 dwt Valiant and the 51.000 dwt Galaxy - and the Fiesta RoPax ferry. True, they are not the huge production runs once known as series ship construction. But to Prince. 12 seems to be the right number for a ship series these days. "I couldn't build a Fantasy class ship today if I wanted to." he says. "They are fine, competitive vessels accepted as preferred carriers, and the owners love them, but so many regulations have changed since 1998 as to render the design obsolete." With this in mind, he modified the series concept to fit shorter production runs. As always, each ship within a series is exactly like the others. Beyond that, the series, where possible, shares consistencies in such areas as layout and equipment selection, bringing a family identity to the whole clan. "The benefit of series ships comes from the fact that most people prefer dealing with known quantities." says Prince. "When you build to a standard design without variation, you develop it into a trade name that imparts to each ship a clear identity, which is a very powerful business tool. "We once heard from a charterer who had hired his first Fantasy," he explains. "He put three days in the charter for discharging cargo, because he had never chartered a 29,000 tonner that did it in less. The Fantasy finished in a day and a half. Now. one and a half days of stevedoring represents a huge savings in time and money, so he went down to the ship to see what was up. When he found the ship was so designed as to make this the normal turnaround time in port, he had one reaction: 'Next time I'll charter a Fantasy.' The Product is a Process GTRC produces its vessels through a highly idiosyncratic process that starts not with what the owners want, but with what the world needs. The principal players in the drama are Algoship Designers Ltd. and GTR Campbell Marine Consultants. Algoship begins by identifying general commercial needs through market research and economic analyses. In an exhaustive study, factors such as national economies, regional development and manufacturing, and trends in the sizes and types of bulk cargo movements are distilled into projections of marine transportation needs, from which a concept ship emerges. That concept is then handed over to GTRC. which, in cooperation with an independent design studio, develops it into an initial design. Next. Algoship finds a shipyard to build the vessel, and together they come up with an ideal sale price. Algoship's goal, to offer a price that is both attractive to owners and profitable to the yard, requires a great deal of trust from the builder, because it means unreserved discussion of labor and material costs. As GTRC prides itself on producing high specification ships, robustly built to ABS SafeHull requirements, competitive costing calls for a very fine pencil. Once that barrier is crossed and a price set. Algoship acts as broker, notifying prospective clients that such a ship is available, at what price, and at which yard. GTRC then takes over as project supervisor, setting and policing the construction schedule with the yard planners. Tight project supervision, says Prince, is what makes it work. The apparent conflict of interest is that Prince runs both organizations - Algoship being a one-man shop - and seems to end up changing sides, from owner to yard, at various points of the shipbuilding process. "GTRC has operated under this philosophy for some 50 years." says Prince. "It has worked out well so far. but can only thrive in an atmosphere of utmost trust. We must be totally transparent, completely trusted by both parties. This is a very personal business, in which one individual builds strong relationships with shipowners, shipyards and classification." Relationships aside, the process can only work if the shipyard is convinced it can build the vessel at a profit. The key to that conviction is precise costing, which can only be done on a finished design. So, before any agreement is signed, GTRC bears up front the costs of detailed analyses and design development, performing full trim and stability calculations, running SafeHull Phase B on the midship section, and refining the design through the work of model basins, design studios and other specialists. With design complete. GTRC sits in on plan approval. "Presently, our design team is in Korea working out a new design branded the Trader, a 30,000 dwt ship to be built to ABS class on a 4+4 contract for Clipper." he says. "Later, our project managers will sit with ABS during plan approval, in order to respond promptly to comments. This can shorten the plan approval process considerably." With the design prepared, there is no room for owner extras, options or alterations - another key page from the Campbell playbook. "1 listen to all comments, and apply the same filters as for all design considerations: 'Does it enhance the safety of the ship, or address a safety issue we have not considered? Does it increase the earning capacity of the vessel? Does it reduce the operating cost of the vessel?' I rarely encounter a comment to a finished design that passes all three criteria." he says. "The product we sell is a ship based on George Campbell's philosophy," he adds. "Part of that philosophy is to eliminate delays and cost overruns. So, while we don't discourage the owner from doing his own supervision, we do point out that our shipyard supervision, which has brought us such respect in China, is as important as our design work to meeting all the goals of the project." Tight process control and adherence to plan make it work, he says. "In effect, we create a team that is part shipowner, part shipyard, part GTRC and part ABS. We go for robust construction, which is why we work with ABS class," says Prince, "and why we have used SafeHull on all our designs since the Fantasy in 1994. The relationship between ABS and GTRC dates back to Mr. Campbell, who used to say he found ABS to be the most modern-thinking of all the class societies." Still Flying the Flag While holding true to his mentor's philosophy, Prince is not his copy. While no less tough in negotiation, Prince is seen in a more genial light than his famously gruff predecessor. He is also not as averse to publicity as Campbell, whose avoidance of attention has resulted in his near disappearance from the public record. The size of the company has also changed with time. Campbell's organization once reached over a hundred employees in half a dozen countries, with 50 in his Montreal design office alone. Today's GTRC is leaner, with a worldwide staff of 40 run from three main offices. Prince says this is the company's natural size. As he prefers independence, he has no expansion plans in mind. But he is expanding its design range. Campbell concentrated his efforts in the Handysize arena, in his day a market of huge potential. Today that potential is more diffuse, and Prince has left his comfort zone to pursue larger ship classes. GTRC now has a Handymax on the market, the 51,000-dwt Galaxy series, and is currently developing Panamax and Capesize concepts. 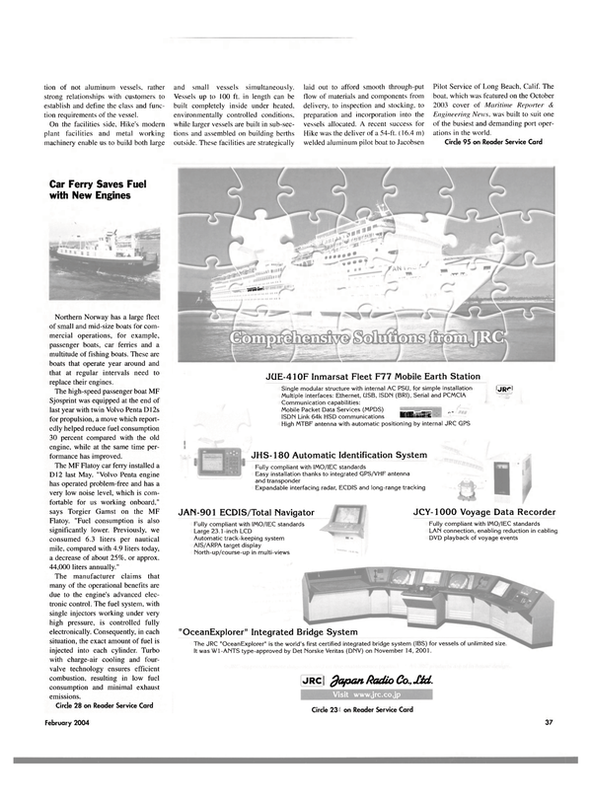 This article was written by Joe Evangelista for the Fall 2003 edition of the American Bureau of Shipping's (ABS) Surveyor Magazine. It is reprinted with permission.